In a surprising, and mostly inexplicable shift, mortgage rates have dropped over the past couple of weeks to bottom out at 2014 lows. Driven primarily by world economic and global health scare news, the markets have defied most analysts explanation by dipping below 4% for Government insured, 30 year fixed rate mortgages, says Scott Schang, Branch Manager, Broadview Mortgage Long Beach. Conventional mortgage rates are not close behind, coming in slightly higher than FHA, VA and USDA year long lows. New mortgage loans closing in either November or December 2014 will not have a first payment due until January, or February 2015. The reason for this is that mortgage payments are made in arrears, which means that the mortgage payment for the month that just passed, adds Schang. When refinancing a home, the old mortgage is paid up until the end of the month, and the new loan payments begin on the day the loan funds. For example, if the Refinance closes on November 20th, 2014, the first mortgage payment will be due on January 1st, 2015. 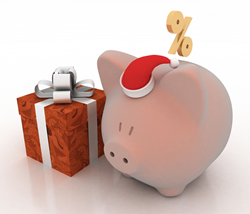 For those lucky enough to refinance before the end of 2014, will have the opportunity to keep those mortgage payments in their bank account, to spend on the holidays, adds Schang. A streamline refinance is a special program available to homeowners that have FHA Government insured, or VA Guaranteed mortgages. Streamline refinance programs allow homeowners to refinance with very little paperwork, reduced cost, limited verification and sometimes even avoid having to pay for an appraisal. In these cases, the good payment history, and a verification of employment is enough to reduce the interest rate, and save hundreds, thousands or more over the term of the loan, says Schang. Streamline refinance mortgages do not allow owners to take cash out for the holidays, but there is an opportunity to skip up to 2 payments, keeping that money for the holidays, and paying a lower mortgage payment once they start paying in 2015. Both FHA and VA interest rates have been hovering under 4% interest for loan amounts under $417,000 for almost 2 weeks now, adds Schang. There are 3 ways we’ve been able to reduce mortgage payments for homeowners that were prepared to take advantage of this “perfect storm” of a market. They include ways to reduce interest rates, how to remove mortgage insurance, and opportunities to reduce mortgage insurance.